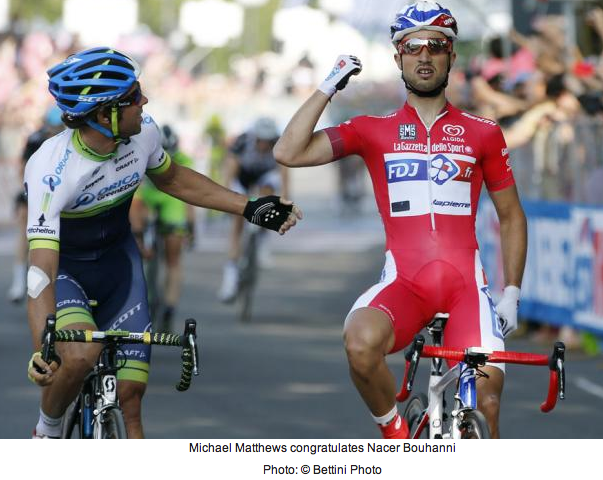 Nacer Bouhanni (FDJ.fr) avoided a huge crash in the final kilometre to take his third Giro d’Italia stage victory in Salsomaggiore. The Frenchman jumped off the wheel of Giacomo Nizzolo (Trek Factory Racing) to beat the Italian and Michael Matthews (Orica-GreenEdge). Cadel Evans (BMC) retained his lead in the race for the maglia rosa. Cadel Evans mantuvo el liderato y los Colombianos sus posiciones despues de diez etapas.